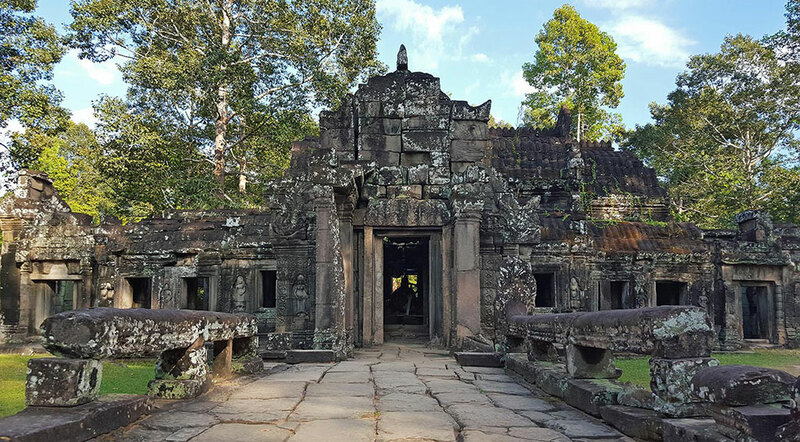 In stark contrast to the often overwhelmingly crowded and popular Angkorian ruins, Banteay Kdei is peaceful and quiet. Its name means “Citadel of Chambers”, which is apt; the ruins are a fascinating maze of chambers that are a delight to explore. 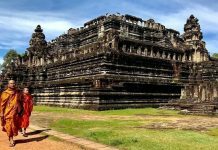 Also serving as a Buddhist temple, these ruins have been home to an active monastery at multiple time periods since their construction in the 12th century, up until the 1960s. 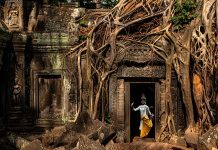 Today, the ruins are overgrown and seemingly forgotten by the bustling Angkor tourism industry. Its solitude and mystery make it a hidden gem for explorers of the region. Tall trees cast shade over Buddhist bas-reliefs, and many hours can be spent in its meandering design. Banteay Kdei is located within Angkor Archaeological Park, so a temple pass is needed to visit. 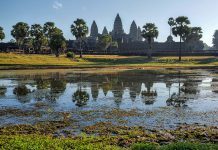 It is also part of the small circuit, which is a 17-kilometer loop that contains all of the “must-see” temples within Angkor Park. Banteay Kdei is located opposite of Srah Srang, which is an ancient and historic man-made reservoir (also known as the “royal bathing pool”). 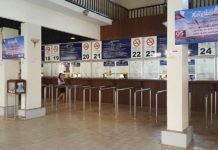 The total one-way distance from Siem Reap is about 10.5 kilometers (or approximately 6 miles). This is a 15-minute tuk-tuk journey or about one hour by bicycle. 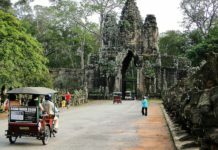 Tuk-tuk or bicycle are the best options for visiting Banteay Kdei. The “small circuit” is on completely flat ground and is very reasonable to tour on bicycle from Siem Reap city center. For more transportation options, see the Getting Around page. Also note that you should allot 30-60 minutes to explore this fascinating set of ruins. As stated earlier, the lack of crowds is extremely refreshing. Being in an ancient temple alone and in peace is a very spiritual experience compared to elbowing your way through a crowd of gawking photographers. 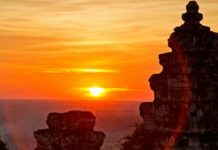 If you seek a good location to watch the sunrise, Banteay Kdei is an excellent choice along with its neighbor Srah Srang. The experience of entering the temple is great, as a Buddhist monk or nun guards a small shrine located near the entrance. A blessing and donation are not expected, so do not feel obligated to interact with the monk or nun if you do not wish. Photo opportunities abound at Banteay Kdei, with its labyrinth of overgrown halls and courtyards. 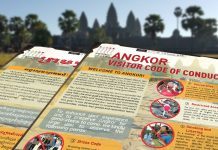 A good strategy for enjoying the Angkor park the most is to begin with a sunrise tour of Banteay Kdei and return to the more popular main temples within Angkor later in the day after crowds have died down. If you hear an extremely loud chirping sound, it’s not a car alarm. It is a species of cicada known for its loud noises, making the jungle surrounding Banteay Kdei almost deafening at times. Also, within the shadowy corners of the temple hang very rare kinds of arachnids, whose colorful bodies make for excellent photos. 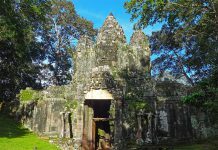 Banteay Kdei was built in the late 12th and early 13th centuries under the reign of Jayavarman VII. 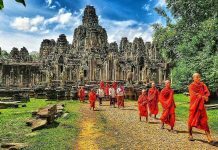 The temple was created in a very similar architectural style as Bayon, Ta Prohm and Preah Khan. However, it is small in size compared to other Angkor temples. The layout of the temple is three enclosures within an outer compound wall. The inner enclosure is lined with galleries that run along its axis and lead to the main temple. Unfortunately, it was built with a poor grade of sandstone and construction methods were inferior compared to other Angkor temples. The very deteriorated condition today is evidence of that. However, ongoing renovation is being conducted in order to restore much of the original condition of the temple. An interesting part of its style is that its gates are adorned with the same face towers, also called gopuras, as Angkor Thom‘s 5 gates. The most agreed upon theory among historians is that the face towers as Jayavarman VII’s signature, and represent both himself and the god Lokesvara (also known as Avalokiteshvara). Another interesting similarity between Banteay Kdei and Ta Prohm is the hall of dancers located just before the entry way on the temple’s east side. It is decorated with apsara dancer bas-reliefs and a seated Buddha that watches over the corridor. Within the courtyard, if you look up at the towers, you can see the historic and interesting devatas. These designs are well-preserved in comparison to the rest of the ruins.